« Is David Archuleta Coming Home Today? Sitting here staring at a blank page. I wonder how many writers have typed those exact words. My own thoughts lately have been about reflecting on where the last six years have taken me as I follow the career of David Archuleta. From being completely off my radar, to being the most talented singer I have heard in decades. Here I am so many years later, still a big fan as well as helping to run a fan site. He is so worth it. I surely did not know that watching a TV show would change my life in so many ways. It’s all due to the joy that I discovered in a young man’s voice. At times it has been exciting as well as confusing to follow the career of a celebrity from his first big break on “American Idol.” We want the best for him, yet it gets frustrating when the forward career movement seems to go so slowly. Every singer has to start out someplace. Having the opportunity for national exposure is about the best jump start a young singer can have. Yes, it takes talent to get noticed, but it take more than that to succeed in a very hard business. I do miss the excitement of appearances, radio station interviews, red carpet events. I learned that no one can sing patriotic songs better than David. How I loved to bash (on fan sites) the DJ’s who try to trap David into some crazy responses. I always felt that he would have a successful career and that it would most likely be a slow progression for him as he found his way with developing a style, as well as find his inner voice. After Idol it was a frenzied existence trying to record a freshman album in the midst of a hectic tour. I often wondered where he found the energy to fit in so much work in so few hours in a day. I just had to be present for all the shows, in spirit. Fond memories of late night crappy cell casts from a fan’s cell phone over a web cam are now a thing of the past. Video has improved so much and cell phone audio is very good now. So, things do get better! It’s truly the fans who have brought David’s performances to us more than any other means. Many thanks to those who watch a concert with one eye on the lens! What I wasn’t prepared for was a two-year break for a mission for his church. There are now less than sixty days until Elder Archuleta’s mission is complete. I began to think about the possibilities that await him. I wonder about what he put on hold back in 2012 and what he will be doing once he has readjusted to his new life back home. He may face a few social changes such as remembering to speak in English or realizing that he no longer has a companion to shadow his every move. It has to be a culture shock to return to his old life, just as it was when he first arrived in Chile. I try not to project my wants and wishes for the career direction he may take, but one thing I do know is that he is ready to sing on stage again. I saw this with my own eyes. He can hardly contain the desire to move and perform. The search for a sound is something he has expressed in video blogs. Where does one find their sound? Maybe it is something you discover by trial and error. David has shown his ability to interpret a song and deliver a refreshing new twist. From watching videos released by the LDS Church, we have seen only Spanish versions of some classic songs. What I noticed as well is the diverse style that David brought to the songs he sang, even though they were classics that I have heard sung in a certain way. As an example, he sang “Little Drummer Boy” in a whole new way from how he performed it in his own My Kind Of Christmas Tour. Jaws dropped as he raised the drum mallets and declared his ownership of the song. Equally effective was the recent version of “Little Drummer Boy” starting with snare drums and his voice front and center, then adding in flute and violin as the song builds to a crescendo. That’s what I like, always a surprise or twist to a song. It was a pleasant surprise recently to see some activity on David’s official site. A simple thing such as a contest to win a scrap of his MKOC stage backdrop has given fans a spark of excitement that we needed. It is a confirmation that they are gearing up for his return in the spring. Most anticipated is the music. Spanish artist Enrique Iglesias has expressed a desire to work with David. This would be an opportunity for introducing David to international audiences that may not be as familiar with his music. I have seen tweets from Victoria Horn, who has been a collaborator, mentioning that she will see David soon. Knowing it will take time, maybe a year or more to have some original songs, I am fine with that. Singing aside, if he has some contracts that were set in motion before he left, so be it. David has proven his ability to step outside of the music. He has what it takes to be an actor or a model, as well as a great singer. One has to balance the artistic with the practical when it comes to a professional career. Nothing worth waiting for can be rushed, especially something that has to flow from within your heart and soul. Take your time David Archuleta. I will be here, there and everywhere as your fan. Very sorry to intrude but you know I–had-to-do-this after that last sentence of yours. Especially with the celebration of their 50th anniversary this week. 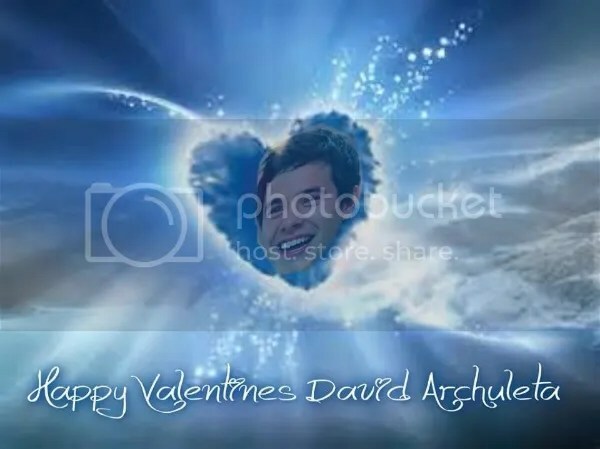 This entry was posted on Monday, February 10, 2014 at 11:45 PM	and is filed under @DavidArchie, @kariontour, @LadyVmusic, Imagine. 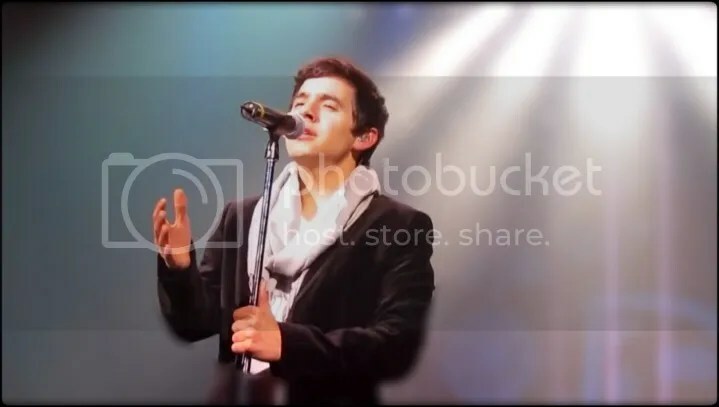 Tagged: #DA2014, David Archuleta, Making me wait, ohyespurple, We'll Be Here. You can follow any responses to this entry through the RSS 2.0 feed. You can leave a response, or trackback from your own site. #DA2014 Almost here! Whoo hoo!!!!! You did a great job of filling up that blank page! Very thorough account of what is going on in our collective minds right now. Where did six years go? If I ever get discouraged that David’s his career isn’t moving fast enough I stop and remember that six years may have passed but we became fans at the very very beginning of his career. I’m anticipating some acting roles for David when he comes back. He delved into Nandito Ako just before leaving on his mission. There is so much more he has to offer in that area; the man is multi-talented! I’d also love him to get some endorsements. We joke in NA chat that we’d buy anything he has to sell. We’re not really kidding! LOL at your opening line. I have been there!! I usually write “Hmmm …. I guess I have nothing to say.” LOL Not a good story starter I’m afraid but I love that your line actually opened up into something thought provoking. Kudos, girl! At first, I just knew David would an overnight sensation. I watched all the videos of fans screaming for him and just KNEW!! Well, things have slowed down a bit but I still believe he’ll be a sensation, just not over night. I realized something long ago that helped me to be patient when thinking of David’s career. Most other artists whose music I have loved were already “in their prime” so to speak as far as their career. I never thought about how long it might have taken, how many local gigs, how much struggling it must have taken, to get to the point where I discovered them. But with David it’s different. Because of American Idol and technology being what it is today, we have the opportunity to watch an artist’s talents grow and unfold before very our eyes. We have been privileged to get to know the person that David is along with everything else. We are actually watching as an artist discovers who he is, seeing the process from the beginning, seeing how he molds himself in to the great artist he will one day be. He is already a fabulous talent, but this is just the beginning. As we’ve seen from the videos in Chile, he’s still improving, getting better all the time in so many ways. Isn’t it a wonderful thing that David is so willing to take us all along on his journey of discovery? While his path is not exactly the one I would have chosen, it isn’t my journey. I’m just along for the ride. I bought my ticket on this train 6 years ago and I still haven’t seen a stop where I want to get off. It’s been a fascinating ride so far, and I think it’s just going to keep getting better. The Beatles, hmmm… like Bebe, I was pretty young and really don’t remember much except my older brother wearing a Beatles wig and playing drums. LOL It still makes me giggle at the thought. I was never a huge fan (I know, shame on me!) because I was so young at the time, but I think I remember walking around singing I Want To Hold Your Hand. haha That’s about the only one I knew back then. By the time I was in my teens, the Beatles fad was over and the rock era had begun! Woo Hoo! Flower Power!! We have to be like the cat at the window for a few more weeks. Watching for that special someone to come walking back in our lives. Another lesson in patience. Jan, knowing that he is home safe is enough for me. I sure hpoe we get that news at least. He can take all the time he needs after that, right? Bebe, he can sell shoes (giggle), shirts, pants ( long and short),hats,sunglasses, sweaters, hoodies, socks, hair gel, shampoo ( only if he bends over a sink, of course, no shower scenes of course! ), conditioner, watches,Armani suits and ties. he is a human clothing rack 🙂 And it all looks perfect on him. It has been exciting to witness every high and low along the way with David. I am not what sure what I would have done if we got nothing from Chile. Thank heaven for the videos! I had a David dream this morning. It took place between 6:00 and :;30 am! I know this because it happened between my 2 alarms which I shut off and went back to sleep. haha! I hesitate to tell it because it was not all goodness and light. But it does show that I have some unresolved thoughts on this topic. Will he be able to “make it” when he is home. I know he will, I guess it’s more how long will it take to get back to the same place. Angelica, thanks for the Beatles song video (and the sweet middle picture). It is in my top 5 fav’s. Thanks to Pocoelsy for her wonderful collage. It has been my desktop for a few weeks. Abrra, yes is will be a relief to know when he is back here safe and sound and like you said he can take all the time he needs after that. He will be with his family and getting back to business! 🙂 I watched a video of an Elder that was down there during an earthquake and was concerned about David when I heard of any that happened. He was never really close to one and I was so thankful. It is so strange how dreams are. They make a point sometimes but parts of it doesn’t make sense at all. I remember having a dream of him when he let Jive go. He was sitting at a table by himself in my basement by my staircase and I was sitting on the stairs asking him if he was all right. He was moping and not talking, but did say he was ok but didn’t want to talk right now. I told him to let me know if he wanted to talk and he said ok. End of dream! haha 🙂 Him leaving Jive must have been bothering my subconscious, concerned about his future! 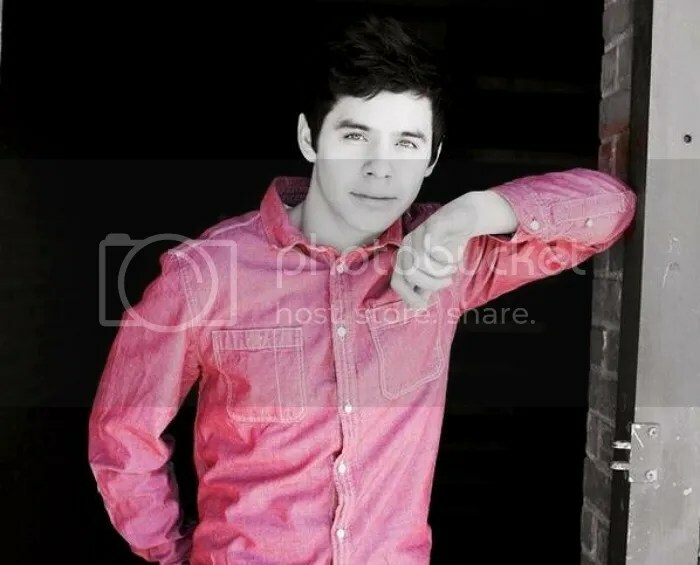 He knew what he was doing all the time and I love the quote “always trust the Archuleta”! A hello to all, been busy and missing in action for awhile, but still checking in here. So very anxious for his return, just knowing he is back on home ground. But am trying to keep my anticipation in check with the realization that he will be needing time to spend with his family, to adjust, and to get things rolling before we get a performance, concert or new music or whatever else he has in store for us. The occasional – occasional hopefully being every day or so 🙂 – vlog or tweet directly from him will be a real treat after this 2 yr void. I admit I get those little flutterby’s just thinking about it. Don ‘t know why, but I have always felt there is a “sound” or “style” he really loves and would like to do, but for various reasons, it hasn’t been the right time. His diverse and encompassing talent creates the “problem” of having to decide on a sound or style. I hope for him to just do whatever it is he wants to do – wherever his happiness is, wherever his passion is. Anticipation! Love that title for a David article. And now we are anticipating what his 50 year anniversary might bring. Surely his legacy will be one of honor and success. Like Abrra, I do not wish to impose my wants and wishes on his career direction. I trust him to reach his own goals. Bebe, I cannot wait for David endorsements. MT has it covered from head to toe: toothpaste and shoes. Everything looks better with David. Angelica, Here There and Everywhere is exactly where I want David. Perfect title. I don’t remember ever hearing that song, so thank you.. Is it too late to thank you for the hilarious Gene Wilder blankie video from the last thread? That was so funny and yet so apropos. Jan and Abrra, I envy you your David dreams. If I have ever dreamed of David those dreams were lost on awakening. Here you go Ray. David sings a short run at 8:18 while the ladies in lingerie prance around the main vocalist 😉 Then we can see David being introduced at 10:45. He sings a duet with Olivia Olson singing “I’ll Be There”. I checked her Youtube channel which has mostly her singing in her room on guitar. Emmegirl, I agree with you that David will have to work out his own sound. It may not be right away, but I know it will happen. Dayzee, I love that pre-concert Anticipation! Somehow it’s not as strong for me in the VIP. That is a whole different “David”. You know the cool, calm version? The stage performer is more exciting and intense! Hmmm. Sitting here staring at a blank page. 🙂 That’s where I, too, am at right now, Abrra. I love what you’ve written, and it covers how I feel, but I just don’t know how to put into words my thoughts on how much I love your thoughts. I have a serious brain stop right now. I’ll blame it on the fact that I’ve spent the better part of the day with my sister and our parents emptying their home so they can put it up for sale. Sad time for me because of some family misunderstandings that have happened. I’ve found myself doing my daily treadmill workout to David’s music. It brings purpose to my day and understanding to my head and heart that these unfriendly things going on can be okay in time. About the blank page – I have stared at one more times than I can remember. Sometimes I find that if I don’t know where to begin, I start in the middle and the beginning will take care of itself once I have written some of the things I want to say. You are so right, Abrra. Wow, how did you even remember that? And thanks, Abrra, for bringing the video here. It’s been so long since I’ve seen it I had forgotten about it. I see some of his signature moves were already there. Wow! Your little iPad did good. Great screen cap. I love the lighting behind him and he looks like he glows! Jan, I loved watching 13 yr old David get his groove on. Not even a hint of vocal issues that I could hear. Djafan Thanks for posting the winners of the piece of MKOC backdrop. Interesting and diplomatic choices. Winnie bid against Angelica (winner) for the pillow auction and now she has finally won a piece of history. Thanks MT. I have a great time making screen caps. Hey Rooster – how about this one (Don’t Tell Me) (young David) – man that guy knows what to do with music! And I’ll do my thing ….. So fitting to hear him sing that. Anyone who thinks David will ever stop wanting to sing AND perform, should take a good listen to this. Sharing his voice in song has obviously been his lifelong dream and up on stage is where he feels he belongs. After seeing the videos this Christmas from Chile, I’d say it’s a safe bet that hasn’t changed one bit. I’ve gone back and read some of the stuff I’ve written and since I’m not a natural writer I thought not to bad haha. But my mind now is in filler mode, you need a filler? I’m there lol. “more excitement is coming VERY soon.” I’M EXCITED!!! PLZ go leave a comment and let the OS know how excited we are!!! Because of everyone’s enthusiastic responses, we have decided to award the prize to not one, but two winners! Congratulations to Winnie W. (username: Mspoohbear) and Salamahafifi Y. (username: Salamahafifi). You have each won a 20 by 20-inch piece of the backdrop from the “My Kind Of Christmas” Tour. To those who missed the contest or who did not win, please stay tuned to DavidArchuleta.com, because more excitement is coming VERY soon. Love the comments that were chosen from the winners. I am new but not so new fan of David, so I have not been to any of his concerts. I am anxiously waiting for his return in hopes of being able to see him perform live in concerts (fingers crossed). I’ve scoured YouTube to watch videos of David’s concerts uploaded by fans all over the world. This is so cool! I would love to win a piece of the backdrop for MKOC concert. Thanks Team Archie! To win the curtain fabric thing would be so random hahaha but so cool! David Archuleta 2014 tour dates and concert schedule for 2014. Limited amount of shows in United States, Canada, UK, Europe so far. Find the latest tour itinerary, tickets, opening acts, set-list this spring, summer, fall and winter in twenty fourteen. Thank you for those links. Hadn’t listened to these gems in some time. What I would give to hear David sing these now, or when he gets back lol. Love soul David, it’s still there. I hear the “it” here. Dja, did I miss the January concerts? Dang it! It’s 2014 and I am still waiting, still anticipating. Need David to come home and sing for us. I don’t care who writes the music, I don’t care who plays the music, just want David to SING it. Dayzee It seems these last few weeks are harder than the last 2 years for fans. David is facing some heavy mixed emotions that are the polar opposite. While he can look forward to rejoining his family, he has also “family” he will be leaving behind in Chile. I hope they have a nice send off for the missionaries who are leaving. Years back, when I played the song for my sisters, they couldn’t believe it was David! Fans are tweeting David today with lovely art. 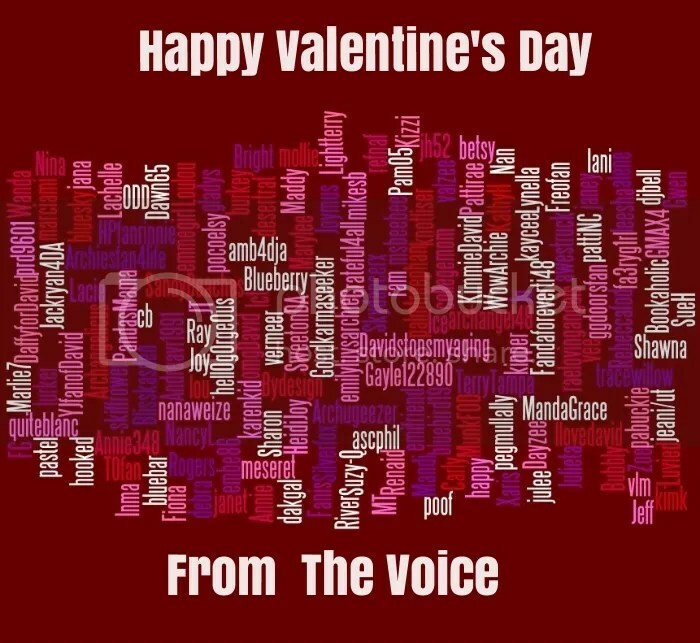 And to the all the fans, especially those who comment here, Happy Valentines Day to you from The Voice! and Happy Valentine’s Day to David! We’ve got snow in NY! Lots of it! But roads are clear here; the sun is shining and it’s a beautiful day! What beautiful cards. This is truly a gorgeous site. Hope your Valentine’s Day is filled with love. I love all you wrote,your thoughts,and reflections on the past 6 years and you said so much that I feel about the past 6 years.Thank you for filling up that blank page so well! The “Anticipation” we feel about him returning from this 2 year personal journey GAH!.I cannot wait for him to return to music, or acting,or whatever else he pursues. Just ready for him to return to the fans who love him so much and have been waiting for him to come home to hear that beautiful voice sing to us again.!!! DO YOU SEE? SEE??? HE KNOWS!!!! Sorry to be so late posting. Been working late every night. Abrra, glad you didn’t let that blank page win. That’s actually a good way to start…just putting down whatever till the inspiration starts to flow. You did a good job of telling your story of being a fan from the beginning with a totally accepting attitude for whatever he wants to do going forward. That pic in #38. Did he save that for Valentines Day? Is there anything he did not plan down to a T before he left? He knows alright, Dja! I’ve suspected it for some time. MT, you say aw, I say ow! With David, there doesn’t seem to be much difference; both responses apply. Like Churchill said of Russia, he is “a riddle, wrapped in a mystery, inside an enigma.” It is that duality of knowing and innocence that is part of his charm and I believe, will be a huge part of his success. Congrats to Winnie and Salamahafifi! That pic at #38 stopped me in my tracks. Excuse me while I go back up there to linger a while. Abs, I’m so glad you got past that writer’s block. I loved your story, beginning to end. the nail on the head. I wonder why this is true. Great picture that was tweeted out today, by the way. Checked online and my flight is on time so I’m heading South to board the cruise ship — heck, guess I know how to fritter away the days of anticipation! LOL —- keep warm my friends! 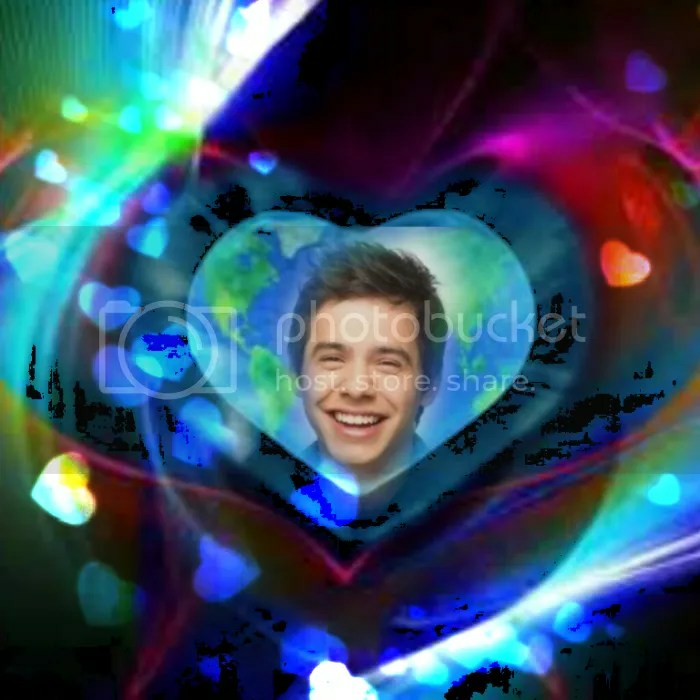 Angelica love your Valentine’s edit. The latest picture from Team David is nice. My only complaint is that Kari (?) did something to it and it’s very light. I tried to tint it but decided to just post it as is. I want every image of David to be perfect and show off how handsome he is. Betsy My thoughts have shifted to how coming back will affect David in the short term. He is a resilient guy, so he will bounce back in no time! Steno You are so lucky to get out when you did. My family was supposed to leave this afternoon for Florida. The airline “robot” called at 11 am to let them know the flight is cancelled. 😦 It’s so sad here. They will be staying home in the snow. Suzy-Q Haha No. and Not yet. “*eyes*” << Yes! He seems to be looking through the camera right at us. It's like he can see us! 😯 How does he do that?!?! Every time the phone rings I think it’s someone telling me…. Every time I get a text…. I have a feeling that when the real message comes in, whether by phone, text, tweet or email it will hit me offguard. “It is that duality of knowing and innocence that is part of his charm and I believe, will be a huge part of his success.” <<< THIS!!! I am away teaching now and will be for another week. Miss you guys! I glanced at the artwork and all I have to say is: good thing I am on a diet – just licking the frosting here could give me a coronary!! Abrra, idk but I really like the contrast in the photo…. it’s different, interesting. I love all the work TeamDavid is doing – appears that it will be full steam ahead when he returns. Emmegirl It was an attempt at an effect that shows the subject in B/W. He looks like a ghost to me. I wish she’d leave his natural beauty as it is meant to be. Note: My area is having a blizzard. Hoping the power stays on. Emmegirl, He gets that Hulk Hogan neck from using his vocal cords and neck muscles to sing I think. Check the neck while he’s belting out the glory note at the end of “In This Moment.” I feel like I’m watching an Olympic event, amazed by the sheer power of his performance. And that sweet spot at 1.37? Abrra, Try to stay warm in that blizzard. I hope you don’t lose power. Like Emmegirl, I like the effect in the photo too. It’s called color splash. I cannot put the color back in, but here it is, all in black and white. That is much better. What I didn’t like was how his face was so washed out. Looks more light balanced in your B/W edit. Yes, better all B/W. By the way, don’t put that as your desktop background. It could be hazardous to your health. I’m gonna take it off pretty soon. Emmegirl, how does he make me feel like he’s looking at me? Us? #57 – have always loved b/w photos. And thanks Angelica for In this Moment, I HAVE noticed that before. One of my all time favorite, favorite performances, btw. To this day it still evokes such emotions in me. Good morning! Thanks for the puzzle Abrra. Dja, glad to see so many thousand reactions to the pic on facebook and twitter. I took it off my desktop finally. Replaced it with this pic posted by Lady V a few days ago. 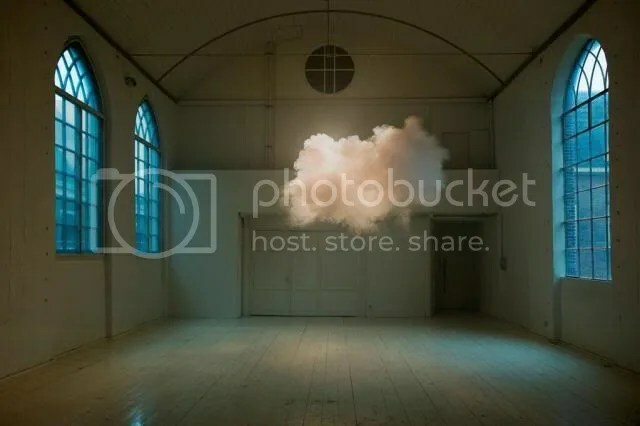 Amazing that an artist actually created a cloud in a room. Makes a stunning desktop. “To this day it still evokes such emotions in me.” It does me too, no matter how many times I’ve watched or how long between viewings. Fierce “in your face” determination in both that song and DLTSGDOM. I’m sure the symbolism of the anchor was intentional. I had a dream last night, just a picture in black and white of him with his head thrown back and to the side the way he does sometimes when he sings. The moment I looked at it the most powerful feeling that this world’s resistance is futile came over me. The feeling was even accompanied by a tinge of pity. Angelica I challenge you to add some David to that nice picture from Lady V.
I liked the anchor jacket too! looking back,I agree with you, great symbolism that anchor. He sure made us proud that night,he put everything he had and more into his performances,that voice…he was completely flawless and amazing. Angelica, that sweet spot ,I wait for it, and the chills that follow.That note is heaven. #DA2014 JUST 39 MORE DAYS!!!!!!!!!!!!!!!!!!!! LMBO!!! See what Deb hath wrought at SnowAngelz!